Uncover an ancient Dwemer secret. Place the warped soul gem inside a Dwemer convector 1-3 times. Use Arniel's Convection spell to heat the Dwemer convector 1-3 times. Speak with Arniel once again. Acquire the staff that Enthir sold. Talk to Arniel in the Hall of Countenance. Talk to Arniel Gane and ask if there is any College business you can assist him with. He'll state that it's nothing official, but he is working on a "project". He refuses to say anything about it, but he asks you to bring him ten Dwemer cogs. They can be found randomly throughout any and all Dwarven ruins. If you have not already found a Dwarven ruin, Alftand is near the College of Winterhold, and the ruin under Markarth is easy to find and lower level friendly. 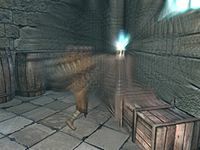 There are plenty of Dwemer cogs inside Dwemer Museum in Understone Keep, specifically in the closest right corner from the entrance; with stealthy movement, all cogs can be obtained without any repercussions, making this the easiest and quickest method. The main College quest line will take you to Mzulft, which also has more than ten Dwemer cogs. Depending on the ruins and your carry capacity (cogs weigh 10 each) you may end up needing two or three trips to get all the cogs or you can go to the Dwemer Museum in Understone Keep. Once you have obtained the ten Dwemer cogs, return to Arniel and he will reward you with a small amount of gold. Arniel needs a very specific item for his project and is having trouble getting Enthir to give it to him. He'd like you to speak to Enthir and return to him with the item. Speaking to Enthir reveals that the item Arniel wants never belonged to him and is Enthir's property. He agrees to relinquish it, though—if you'll retrieve the Staff of Tandil he sold to an unscrupulous character. The character is a boss level caster in a radiantly assigned dungeon. Depending on which one you get the quest may be increasingly more or less difficult. Some of the dungeons, such as Boulderfall Cave and Cragwallow Slope, are extremely small while others might be rather involved or of a difficult nature. The staff should be either on the boss level caster, somewhere nearby, or in the boss level chest. Once you have the staff, return to Enthir. He'll give you the warped soul gem, which can then be returned to Arniel to proceed with the quest. Begin this quest by asking Arniel about the progress of his project. He will say that it is going terribly. He reveals that he is trying to simulate the disappearance of the Dwemer but the warped soul gem that you acquired for him needs to be charged. Unfortunately, the apparatus he was using to charge it was destroyed in the process and he has no time to build another. Thus, he is only too happy to accept your generous offer to charge it for him. 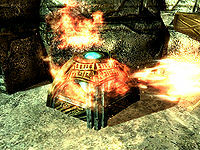 Arniel tells you that the Dwemer used to use convectors to charge their soul gems and that some of these devices probably still exist among Dwarven ruins. He needs two more charges after his own initial charge to power the gem. Due to the nature of the warped soul gem, it will destroy the convector it is charged in. What you need to do is find a few Dwemer convectors and place the warped soul gem inside. He will teach you a spell called Arniel's Convection that must be channeled onto the Dwemer convector until the stone is charged. Keep channeling the convector until the quest updates. You will then have to find a new convector and repeat this process up to two times. There seems to be some variance on whether it takes one to three times to fully charge the stone and use of dual casting can complicate the matter. Druadach Redoubt: Across the river from it in an unmarked ruin, east-northeast of the map marker. Deep Folk Crossing: Across the bridge from it at an unmarked ruin, just north of the map marker. Dwarven Storeroom: Simple freestanding Dwarven structure near Mzulft. No enemies. Mzulft: Near the entrance in the first rooms after the hall, just before the second incline. Must have started Revealing the Unseen. Ruins of Bthalft: Exterior only ruins, bandits here. Shor's Stone: Southwest of the village at an unmarked ruin with a single warlock. Two are northward of Karthwasten, one south of Ivarstead, one southwest of Shor's Stone, and two among the ruins of Mzulft. The two northwest of Karthwasten are probably the easiest to use since no enemies spawn at their locations (wild animals may be a nuisance however) and they are relatively close together. One is directly north of Karthwasten, northeast and across the river from Druadach Redoubt. It is at the base of the unmarked Dwemer pillar. If you cross the river and follow it upstream you will come to Deep Folk Crossing. Cross the bridge and the second Dwemer convector will be in front of you. The one south of Ivarstead is at the Ruins of Bthalft and has bandits. The one southwest of Shor's Stone is between there and Autumnshade Clearing and has a rogue mage. At Mzulft, one is inside the storeroom (a separate building to the right of the ruin entrance when you arrive) and the other is within the ruins proper. Unlike previous parts of the quest, about two or three days must pass before continuing. Thereafter, talk to Arniel again. He is often to be found on the upper floor of the Hall of Attainment, but may also be in the Hall of Countenance. Once more he's used Enthir's services, and once more you have to pick up the pieces. Talk to Enthir, who is almost always in his room in the Hall of Attainment. He's quite annoyed since he has no idea where the item is—or even what it is, for that matter. He was only tasked with providing transport for it from Morrowind and it simply hasn't arrived. Enthir tells you to go look for the courier somewhere in the east, and marks a location on your map. The precise location of the courier varies. When you finally do locate him, it's immediately apparent why he didn't complete the delivery. Retrieve the blade "Keening" from his body and return it to Arniel. He is outraged that it wasn't wrapped properly, and amazed that you didn't die when you touched it. By way of explanation he relates something of the background of Keening and Sunder, the legendary tools of the Dwemer Tonal Architect Lord Kagrenac. Arniel now conducts his experiment in an attempt to figure out how and why the Dwemer disappeared. Striking the warped soul gem with Keening, he finds that it does nothing. He strikes again, gaining no apparent result once more. Having lost his temper, he curses, lashes out a third time... and disappears in a flash of light, never to be seen again. The quest is then unceremoniously updated as complete. Pick up Keening from the floor if you wish (although it seems to have come down in the world somewhat since the Third Era). Summon Arniel's Shade will be added to your spell list automatically. Part three is not available until you complete the quest The Eye of Magnus. It's thus irrelevant that one cannot enter Mzulft until having started Revealing the Unseen to find the convector, since this quest has already been completed long before The Eye of Magnus. The quest tracker will not track Dwemer cogs you pick up, but they still count for the quest, so you must keep count of them yourself. It is not necessary to carry around all ten cogs at the same time; utilize storage at the College to avoid carrying around the heavy cogs. Part two is almost identical in nature to Onmund's Request, but the radiant dungeon assignment might differ. It is possible to be sent to the same location in both quests. No matter how many times you use Keening to strike the warped soul gem, you will not disappear in a blinding flash. Enthir will have slightly different dialogue during this quest if you are the arch-mage or completed Hard Answers. In some cases the warped soul gem will get duplicated after heating it. This prevents further dialogue with Arniel, thus making it impossible to complete the quest. You may be able to fix this by leaving one of the duplicates of the gem in the Dwarven convector. This should allow you to be able to finish the dialogue with Arniel. You can remove extra warped gems through the console with the command player.removeitem 6a10a 1 for each extra warped gem in your inventory. Assuming this does not occur on the third and final convector heating, this can be fixed by putting both soul gems in the next convector box and then heating it with the spell, this will result in one of the soul gems disappearing, thus leaving only one to collect and allowing the completion dialogue with Arniel. This can be caused by adding the Destruction: Augmented Flames perk or Dual Wielding. The quest can fail to update, getting stuck on "Place the warped soul gem into a final Convector". Dual/single casting, alternate convectors does not remedy. Mod Notes: The objective displayed jumps ahead of the item you possess, causing the script conditions to fail. Load a save from before the first convector was used, and heat each convector by casting with a single hand only in short pulses, stopping immediately when each quest stage is reached. Another option is to place the warped soul gem into a convector, type setstage MGRArniel03 20 in the console, then heat the convector and the quest updates. Make sure that you did not leave any item in any convector, they must all be empty. After returning the gem the quest will be completed but if you look at it under completed quests the bullet marker for the last stage is hollow (as if the stage was not completed). This does not seem to affect game play. 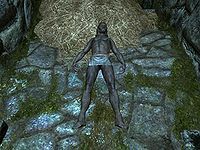 It is possible to get Keening from the courier before talking to Enthir about the mysterious item Arniel wanted delivered from Morrowind. When this happens, you can find the courier, but you can't advance the quest because you can't get Keening from him again. You can wield Keening in front of Arniel and talk to him. This could trigger the following stage. You can also wield Keening and use a weapon plaque, then remove it from the plaque. Sometimes this doesn't work and instead the weapon is placed on the ground. Just get a follower to pick it up. When you take it from them, the quest will update and work properly from there. A quest journal would trigger multiple times. Keening may disappear with Arniel instead of falling to the floor as it should. Keening may be forced through the floor and land in the room below the storage area where Arniel's experiment is held. If it goes missing, try looking for it on the first floor of the Hall of Countenance where Phinis Gestor normally sleeps (the first room to the left if you're facing the stairs). If Arniel happens to have another weapon equipped before you give him Keening (he has a tendency to pick up stray weapons on occasion), he will attack the warped soul gem with that weapon instead of Keening. The quest will still proceed as normal however, and Keening will still drop when Arniel disappears. If you previously killed the boss of the radiant dungeon that contains the Staff of Tandil, the quest marker may direct you to the empty space where the boss's body lay. Type setstage MGRArniel02 30 and player.additem 0006a093 1 in the console to acquire the staff and continue the quest. Enthir might not actually take the Staff of Tandil when you bring it to him, but it is not marked as a quest item after showing it to Enthir, so you can drop or sell it as you want. It is possible to turn in the ten cogs to Arniel before he has given you the quest due to a missing condition on the dialogue. The Staff of Tandil isn't marked as a quest item before showing it to Enthir. In the German version of the game you are asked to collect "Fässer", which translates as barrels, rather than "Zahnräder" (cogs). 10 Arniel Gane has asked for help with a special project he's working on. Although he won't tell me what they're for, he wants me to bring him a number of Dwarven Cogs. 200 Finishes quest I've given Arniel Gane the Dwarven cogs he asked for, and he was quite grateful. He's suggested that there may be more I can help with in the future. 10 Arniel has asked for more help with his project, though this time the request is very different. Enthir is apparently refusing to follow through on a trade; something Arniel needs for his work. He's asked that I go speak with Enthir on his behalf. 20 Arniel asked me to deal with Enthir, who was supposedly refusing to complete a business arrangement. Enthir insists that he hasn't been paid, but will consider the deal done if I acquire a staff for him from <Alias=Dungeon>. 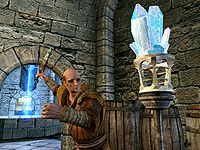 40 I've managed to complete the trade agreement between Enthir and Arniel, and have the object Arniel was interested in. It's some sort of soul gem, though Enthir believes it to be useless. I should deliver it to Arniel. 200 Finishes quest I've successfully completed a deal between Enthir and Arniel that is somehow related to Arniel's special project. He claims to be making progress, though I have no idea what that means. 10 Arniel has finally revealed to me that his secret project deals with the disappearance of the dwarves, though he hasn't been clear about how his work relates to it. He's given me a warped soul gem, and asked me to find several Dwarven Convectors in the various ruins around Skyrim. I'm supposed to place the gem inside a convector, and then heat it using a spell Arniel has taught me. When I've done this several times, I should return the gem to Arniel. 40 I've successfully altered Arniel's warped soul gem, and should return it to him. It is somehow critical to his project regarding the disappearance of the dwarves; perhaps he'll explain exactly what he's up to. 200 Finishes quest I've once again helped Arniel with his secret, and very vague, project relating to the dwarves. He implied that he's waiting for something else, and then finally maybe I'll see what this is all about. 10 Arniel has once again asked me to speak to Enthir, who was supposed to deliver something else relating to Arniel's project. 20 Arniel was convinced that Enthir was refusing to complete the trade the two of them had arranged, but it turns out that this time Enthir never received the item in question. The courier bringing the item never arrived. If I want to help Arniel finish his work, I'll need to find the courier myself. 30 Arniel was distraught over being unable to finish his project, believing that Enthir was refusing to complete a trade the two of them had agreed upon. Instead, the courier that was supposed to deliver the item never arrived. I've tracked him down (sadly he did not survive) and have the package Arniel wanted. I should make sure it gets to Arniel as soon as possible. 40 I've helped Arniel with the final piece of his project, by tracking down a missing courier who was supposed to be delivering an item from Morrowind. That item is Keening, a dwarven dagger that Arniel claims is very important. With it, he says he's able to finish his experiment and has asked that I observe what happens. 200 Finishes quest Arniel's experiment is over, but I'm not entirely sure what has happened. He has vanished, leaving behind the dagger Keening. I may never know whether he succeeded in his work. This page was last modified on 7 December 2018, at 14:20.